Andy Cunningham has been at the forefront of tech and innovation since day one, and she's been helping companies create new product categories ever since. Now she reveals the winning framework she uses to transform markets and industries. Get to Aha shows how to establish the kind of foundation world-class brands are built on. Too many business leaders fail to ask the most basic questions about their company--Who are we? And why do we matter?--before they leap right into branding. Big mistake. A company must first know itself (establish its position) before it can express its identity (execute its branding). There are three types of companies in the world, each with its own DNA: Mothers are customer-oriented, Mechanics are product-oriented, and Missionaries are concept-oriented―and it's absolutely critical for business leaders to know which type their company is to create an authentic and ultimately "sticky" position in the market. A company's DNA is the key to achieving this and with it, a competitive advantage. Why? Because if a Mechanic creates a marketing campaign based on its belief that it is a Missionary, the underlying positioning will not ring true and the company won't gain a foothold in the market. But if a company positions itself in alignment with its DNA, it will resonate authentically and establish its role and relevance even in the face of a major competitor. 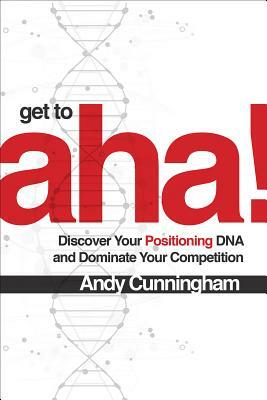 Get to Aha presents a clear step-by-step framework that will help you determine your company's precise position in the marketing landscape, using Andy's DNA-based methodology. It takes you through the process of performing "genetic testing" on your company, examining the market through the six Cs of positioning, and developing your positioning statement--a rational, factual statement about your company's role and relevance. Then and only then can you create a branding and marketing strategy that will build market momentum and crush the competition. Andy Cunningham played a key role in the launch of the original Macintosh. Since then, she has been an entrepreneur at the forefront of marketing, branding, positioning, and communicating "The Next Big Thing." The founder and president of Cunningham Collective, a marketing and communication strategy firm, she has helped introduce a number of new categories, including video games, personal computers, desktop publishing, digital imaging, RISC microprocessors, software as a service, very light jets, and clean tech investing.